This outfit is acting like the stripes on a wasp... a warning to anyone who thinks they can take me on. Don't even think about it. The Sass-O-Meter is off the scale. Outfits like this one are a great way to appear confident and in control. A mixture of patterns, textures and prints. A little bit of humour. A little bit of attitude. This T-shirt makes me smile. They say sarcasm is the lowest form of wit and I have to agree, but it doesn't stop me partaking every now and then! Being sarcastic can be fun... and very funny. A well-timed sarcastic remark can break the ice and even defuse a tense or stressful situation. Well placed lighthearted humour can be the best medicine. However, snarky sarcasm is never a good idea, is it? Being sarcastic too often puts you in danger of sounding like a smart arse or stupid, and it's definitely annoying. Personally, I love a sarcastic quip but it's only fun if the person on the receiving end 'gets' your humour. Making a fool of someone who doesn't understand what's happening is never cool, or particularly funny. I like being sarcastic with people who I know will fight back and give as good as they get! There's no clever way to link those two unrelated things is there? Culottes don't seem to be going anywhere for 2018. I struggled with them initially, but now I love the style! My feeling towards culottes reminds me of how I used to get my children to eat food they didn't like. I just kept giving it to them and eventually, they began to come round to the idea! I love culottes now and I'm even looking for more. Longer culottes are very versatile and easy to wear. I think they look great dressed up and dressed down... any time of year. I hope they stick around for a while longer. What do you think about sarcasm and sarcastic comments? Are you glad they're hanging around or can't wait to see the back of them? I'd love to hear your opinion on both! See them Styled differently HERE, in winter with Red. HERE, in winter again with Cobalt! HERE, with beige (yawn) and green. I like these culottes too... and these! SARCASTIC TEE SHIRT: River Island (charity shopped)... similar. BLACK SHOES: Clarks... these are fab, and reduced... and these too! SILK SCARF: Vintage.. this one is nice. Ha yeah! We do have similar colors and peep toes! 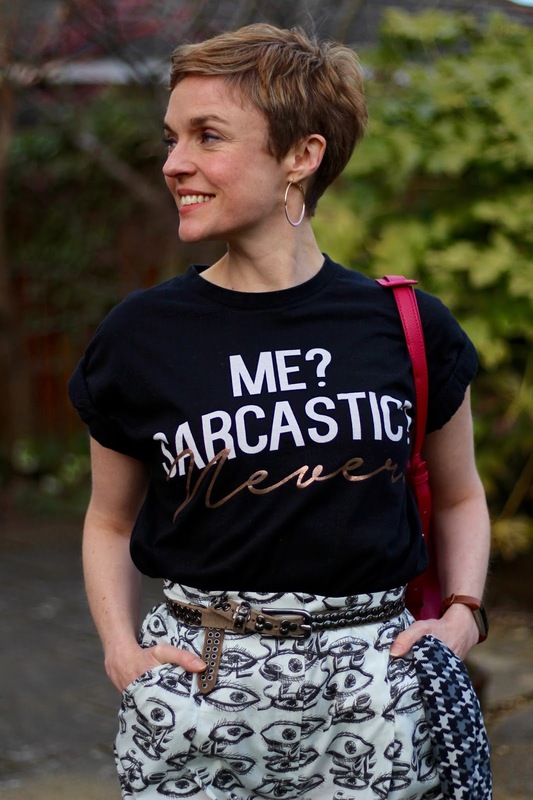 Do you know what is even funnier: I have a tee that says: I speak fluent sarcasm! Have a great weekend Samantha! I did laugh when I saw your peep toes and net socks. This is the reason husbands become ex-husbands! I love sarcasm, but you are right - you have to use it judiciously and with those you know will take it on. I love the outfit. Eyeball culottes. Hahaha!! Great. I'm glad you agree that it's not fun unless the recipient is switched on to your wavelength. 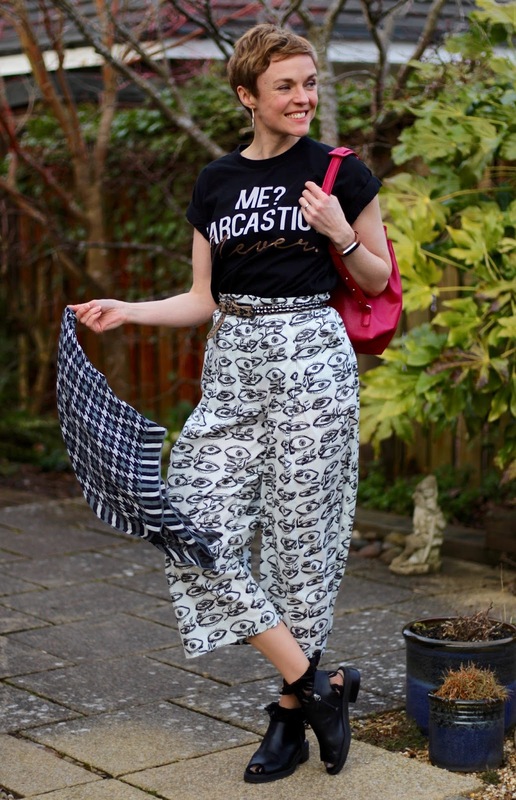 I haven't warmed up to culottes yet but this evil eye print (?) is getting me closer. I think sarcasm is best used when someone really deserves to be put in their place. Mostly because they're quick to put others down with hurtful quips. I have 20/20 hindsight with most of my sarcastic remarks and rarely get a comment off at the perfect moment. If only we could be a quick witted and as funny in the moment?! This might sound weird, but I actually think sarcasm is pretty high up on the wit scale, if that makes sense? I've heard some pretty clever sarcastic one-liners! I definitely agree with you on this: sarcasm is only OK when it's used in a fun back-and-forth banter. But used wrongly and you get ugly consequences; I've heard some sarcastic remarks that were meant to hurt, which were so not cool. I have a friend who used constant sarcasm to hurt another friend up to the point they're no longer friends now, eek. I suppose a real friend knows when to quip and when to reign things in and be kind. Being hurtful is never funny. I love a sarcastic remark, when it doesn't harm anybody (even if some people could deserve it! ), and also love a slogan t-shirt when worn with attitude (and you've got lots of it). So this outfit totally rocks and you look gorgeous in it!. 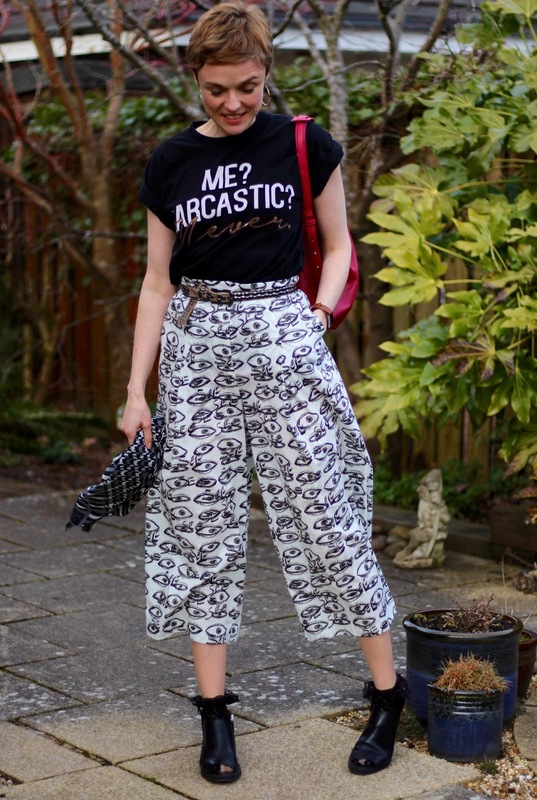 You're even making me look at culottes as something groovy and cool!, because yours are lovely (That Print!!) and your shoes are perfect!. These shoes are really comfortable too. I am super sarcastic, too! So I love this post as I love all of your posts. Such fun culottes, too. And those lace socks are adorable! This post is a featured favorite on my link up today! Thanks so much for joining the party. Awwwww... thank you SO much Shelbee. How kind of you!! I love reading your thoughts! I try to reply to as many as I can so don't forget to tick the "notify me" box! Over 40 style and Fashion blogger... encouraging women to embrace individuality, have fun with fashion and keep faking that fabulousness...at ANY age! Easy Halloween makeup, part 1 | Ghostly Terrors! The Anti-Ageing Secret Big Brands DON'T want you to Hear! Why I've Stopped Hosting a Blog Link Up... the Truth! Embarrassing Ageing | My Pelvic Floor is Shot to Pieces! What's Wrong with Dungarees and Short Hair? All images belong to Samantha Blair. Please ask permission & link back to this blog if you use them. Powered by Blogger. PLEASE NOTE: Any items marked "c/o" were gifted to me. This does not mean I have to say I like them! All of my opinions are genuine, and honest. I use affiliate links in the Get the Look (or Shop the look) section. This means that if you click through and buy, I earn a small commission. There is no extra charge for you. If you subscribe to my emails and updates (via Feedburner) I will not pass your details on to third parties for any purpose.